EVIL people inhabit our world. We must find them & make them SUFFER for their wrong doings. This goes beyond cruel. I can only imagine how much suffering these poor animals had to endure, all because of one or more monsters. Like the man interviewed said about the person that did this "... they should not be allowed to walk on the earth". I agree with him. Noted & Signed. Thank you very much Carmen. Signed and shared. Thank you, Carmen. Signed and noted. These are truly evil dangerous people and the sooner the authorities get a grip on this fact the sooner animals and the rest of us will be be in a safer place. It is not a quantum leap to link animal torture and murder to human. S/S thx . they should put surveillance camera's so they can catch these depraved beings. Thank you, Carmen. Signed ! Robert Ortiz, your signature was added to the petition! Sick people are all over the world, hope they find this animal killer!! Signed. People who abuse animals likely also mistreat people. There is never any upside to letting someone get away with animal cruelty. When are we going to get smart and start executing/exiling/imprisoning for life psychopaths that do this heinous acts? Psychopaths abuse animals today and people tomorrow! Find the thing responsible for this and put the same tape around its mouth and left it to rot!!! Noted and signed - this psycho needs to be found - and bashed to death. 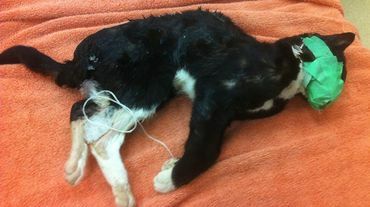 From what I saw on the cbc.ca website, it looks like the kitten would have died of suffocation, not starvation. I live in the next city north of Calgary, and can't help thinking of my friends who live there - they all have cats. I sincerely want the POS who did this DEAD. I want him dead exactly the same way he murdered that poor kitten, and I want him to be afraid while it's happening. I want him to suffer. I know that won't happen. It will be a miracle if the police even catch him. thank you for the posting, Carmen.